A few weeks ago I decided to work on a list of superhero picture books so I would be able to refer my youngest patrons to something more than the many 8x8's and early readers featuring the Marvel and DC characters, and hopefully find some suitable for storytime. Now, let me preface this by saying that superheroes definitely are not my thing to begin with, but though I was initially pleasantly surprised by how many picture books I found in our collections with the subject tracing "superhero", once I pulled them and started looking at them I was a little disappointed that I didn't find many that I could see myself using in storytime. So this list is more for reader's advisory than storytime, and limited to what is in the collection in my library system, though I have noted the ones I thought would work for storytime. Superhero ABC by Bob McLeod, 2009. McLeod, a renowned comic book illustrator, brings us his first children's book with a different superhero for each letter of the alphabet. Some are a little silly, but very authentic looking and likely to appeal to DC and Marvel fans as well. Very fun and cute. Each letter is shown in both upper and lower case, and alliteration is used in the descriptors of each hero to emphasize the letter. This book might work for storytime, at least as well as any other alphabet book, as the main text on each page is fairly short. Batman's Dark Secret by Kelley Pucket, illustrated by John J. Muth, 2016. This book tells the origin story of Batman, in true storybook form rather than in comic strip panels with speech bubbles. The text is short and simple, and age appropriate. The illustration are very dark, helping to convey the sense of tragedy and staying true to the traditionally dark feeling of the comic. This book is short enough for storytime, but I'm just not sure if the tone is right, and I know most of us prefer to avoid heavily commercialized characters in storytime. 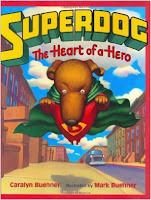 Ralph Cosentino has written three picture books about superheroes. Each tells a general story, revealing the orgin of the hero, what their powers are, some of the villains they fight, and other background information. The illustrations are a combination of full-page illustrations and panels, with a general comic book feel, but a little simpler. I don't think these would be good for storytime, but would be good for one-on-one and independent reading. Mighty Truck by Chris Barton, 2016. Clarence was an ordinary truck, other than ALWAYS being dirty. It seemed everything he did for fun got him dirty, and that's what his friends were used to seeing. One day, he grudgingly goes to the carwash during a storm and gets struck by lightning. Not only does the lightning supercharge the carwash and get him extra clean, it gives him superpowers as well! This is a cute story that would work for preschool storytime, either with a superhero theme, or with a things-that-go theme. It's probably best for the younger crowd; serious superhero fans probably would not appreciate it as much. 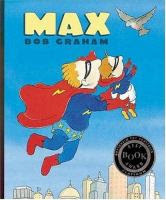 Max by Bob Graham, 2000. Max comes from a whole family of superheroes. His parents are Captain Lightning and Madame Thunderbolt, his grandparents are also superheroes, and Max is expected to be a superhero, too. There is just one problem. Max can't fly. His parents are concerned, and he gets teased at school. Then one day Max discovers he can fly after all; he just needed the right motivation. This is a cute story that is too long for a typical storytime, but would be a great one-on-one read. It might work for a group read-aloud with older kids, but it's a fine line between being old enough to listen to a longer story and being too old to be interested in a non-DC or Marvel superhero. 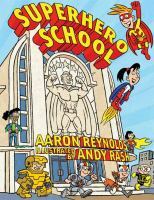 Superhero School by Aaron Reynolds and Andy Rash, 2009. Leonard was not surprised when his parents told him he was going to a special school for superheroes. After all, he was the only kid in his class who could hit a baseball into orbit, had clobbered a lava monster, and welded the Bay Bridge back together with heat vision. But he was very surprised (and disappointed) to learn the even at superhero school he still had to learn math! I was really disappointed with this book. I have used books by both Aaron Reynolds (Creepy Carrots) and Andy Rash (Are You A Horse?) before and had high hopes for this as a storytime book, but it is just too long, with way too much text for my preschool groups. But the story is good, and it shows that everyone, even superheroes, needs math. Atomic Ace (He's Just My Dad) by Jeff Weigel, 2004. In this story, the son of Atomic Ace describes what it is like to have a superhero for a dad, showing that at home he is just a typical dad, doing everyday family things. The story is told in a combination of comic book form and traditional text and illustrations. 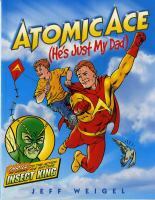 The parts describing Atomic Ace as a superhero at work are told with graphic panels and speech bubbles, but the parts showing his home life are traditional drawings and text, emphasizing that at home he is just a "normal" dad. Too long for preschool storytime, but good for a one-on-one read, or for an older group read-aloud. There is also a sequel, Atomic Ace and the Robot Rampage, in which villains accidentally target Atomic Ace's son by mistake. 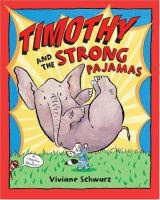 Timothy And The Strong Pajamas by Viviane Schwarz, 2008. Timothy wants to be strong, and tries drinking fortified milk, exercising, and thinking strong thoughts. But it isn't until his mother repaired his favorite pajamas with extra-strong thread, reinforced seems, sturdy patches, and extra buttons that he suddenly gains super strength and becomes a hero. 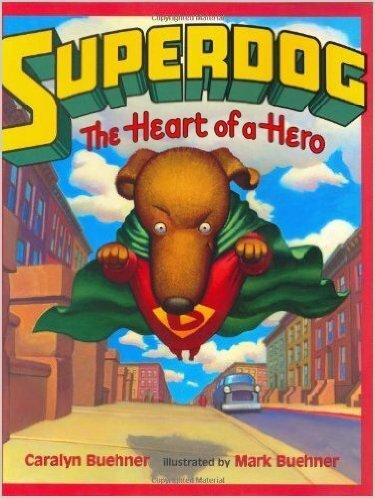 But when he rips his pajamas and loses his super strength, the animals he had helped become his heroes. A cute story, but probably not what most kids would want if they are asking for superhero books, but it is a good book about kindness and helping others. 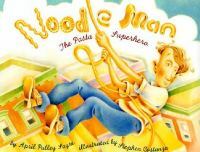 Noodle Man: The Pasta Superhero by April Pulley Sayre and Stephan Costanza, 2002. Al Dente's family owns a fresh pasta market, but business is lagging since everyone wants pizza. Al invents a portable fresh pasta machine that has unintended consequences, leading Al to perform several heroic feats around the town, and saving the family business. This book would be great for a family storytime, with all of it's silly puns that adults are more likely to get than children. This story would also work well for a food theme, along with Cloudy With A Chance Of Meatballs and Strega Nona, though they are all a bit too wordy for the younger kids. Several different types of pasta are shown in the endpapers, and there is information about pasta in the notes at the end. 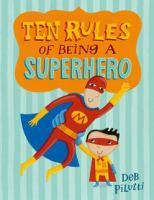 Ten Rules Of Being A Superhero by Deb Pilutti, 2014. In this book a young boy pretending to be superhero sidekick Lava Boy presents the ten rules of being a superhero, such as a superhero must always respond to help, saving the day can be messy, superheros must be brave, etc. There are a couple of exceptions, and moms in particular don't get rule #2. But the most important rule of all is that all superheros need a sidekick, "Because saving the day is more fun with a friend." I think this one would make a good storytime book. It it not too long or too heavy with text, the illustrations are bright and engaging, and it is clever and slightly humorous. 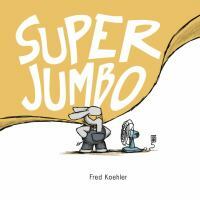 Super Jumbo by Fred Koehler, 2016. Little Jumbo loves pretending to be a superhero, but his parents don't seem to appreciate his super strength, his speed, his crime-fighting methods, and especially not his making his cape from the living room drapes! But he still does what he can to lend a hand and help others, because "saving the day with a friend can make the world a little more super." This book is short enough for storytime, and children can definitely relate to being misunderstood and unappreciated, seemingly getting in trouble "for nothing". It is also nice how it ends with the message of friendship making the world a better place. Princess Super Kitty by Antoinette Portis, 2009. Finally, one with a female protagonist! 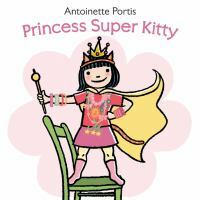 In this imaginative story, a little girl first pretends to be a cat, which then evolves into Super Kitty, a feline superhero with super strength, x-ray vision, and the power of flight. Then she become Princess Super Kitty, who wears jewels, issues royal decrees, and leads parades. Then, finally at bath time she becomes Water Lily Hula Porpoise Princess Super Kitty of the Sea. 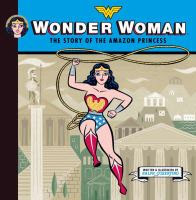 This book is really more about using your imagination than superheroes, but it would still work for a superhero theme, and shows that girls can be whatever they want, whether it's a superhero or a princess. It would also be good to help include and engage the more "girly-girls" in a superhero themed program. 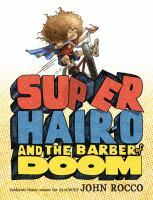 Super Hair-O And The Barber Of Doom by John Rocco, 2013. In a story inspired by Sampson, a young boy and his friends believe they have superpowers imbued by their hair. The longer their hair grows, the stronger their powers are. Then, one day our hero is captured and dragged to the villainous barber's lair, who cuts off all of his hair. What will become of his superpowers? What will his superfriends think? A cute story with engaging illustrations, short and simple enough for storytime. The best part is the author's school photo at the end, showing his hair just like the hero in the story. 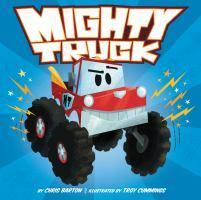 Mighty Max by Harriet Ziefert and Elliot Kreloff, 2008. Max is an adventurous little boy, perhaps a little too adventurous for his dad. On a day at the beach he pretends to be superhero Mighty Max, using his super strength to help unload the car, and saving a beach ball, a sand castle, and his lunch! This book might work for storytime, as it's not too long and has a relate-able story. The illustrations look much like a child's crayon drawings and are colorful. 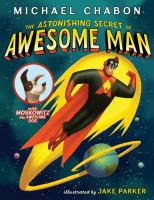 The Astonishing Secret of Awesome Man by Michael Chabon and Jake Parker, 2011. In this story we meet Awesome Man. He has a red cape, black mask, and a letter "A" on his chest. He can fly, cross time barriers, shoot positronic rays from his eyes, and has his trademark Power Grip. He changes to his secret identity to hide from villains, and retreats to his Fortress of Awesome to calm his anger and recharge after a battle. In the end, we see that his secret identity might not be who we first thought. This is a little long for preschool storytime, but would probably work well as a one-on-one read or with kindergarten-2nd graders as a group read-aloud. The illustrations are bright and engaging, looking more like modern animation than a comic book. It has a slight twist, as in the beginning it seems as the story is about a real superhero, but in the end it turns out to be a little boy pretending. There's plenty of action, but I also like how the author snuck in the message about controlling your anger and giving yourself a time-out to calm down and re-charge when overwhelmed or overtired. Dex is a little dachshund, and the other animals in the neighborhood always make fun of him for being so little and short, especially Cleevis the tomcat. But Dex dreams of being a hero, so first he researches (at the library, of course! ), then he begins working out, building his strength and stamina. When he is ready, he gets a superhero costume and starts rescuing those in need, despite still being teased. Then one day, his arch-nemesis Cleevis is stuck in a tree and needs rescuing! This is a cute story with bright illustrations, but too long for storytime. 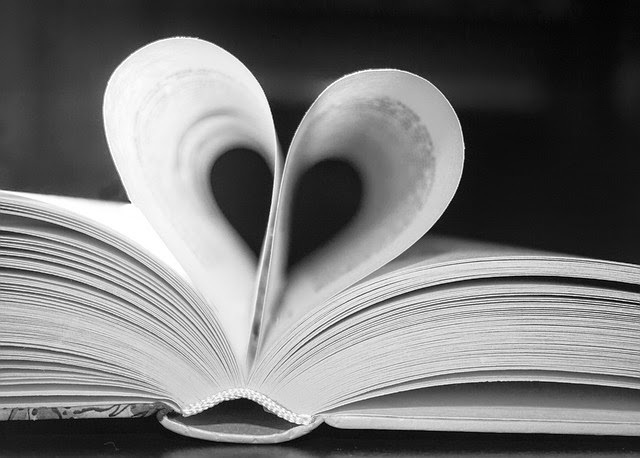 It might work with older kids for a group read-aloud, but is probably better as a one-on-one. I love how little Dex learns to ignore the teasing and doesn't give up on his dreams, and I particularly appreciate that it shows him going to the library to do research. I think kids will like twist at the end when he gains a surprising sidekick. 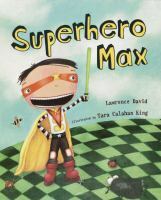 Superhero Max by Lawrence David and Tara Calahan King, 2002. Poor Max is the new kid in school, and having a little trouble making friends. But when he shows up in an awesome superhero costume for Halloween, the other kids are impressed and invite him to play, so he continues to wear his costume to school each day, even though his classmates have moved on to other games. Max gets frustrated and begins to act out, getting in trouble, but eventually learns to make friends by being himself and playing what others want to play sometimes. This is another book that is pretty wordy, but it is a good lesson about learning to fit in while still being yourself, and learning to compromise. This is a lesson that some kids have a hard time with, learning that sometimes it is better to play what other people want to play in order to play together and have friends. I wasn't really looking for everyday hero books for this list, but I did happen to come across a couple that I thought were worth mentioning since they could help round out a "Superhero" or "Hero" themed storytime (or would be good for Mother's Day or Father's Day). Please understand that I realize this is not, nor is it intended to be, representative or inclusive of all the other everyday heroes out there. 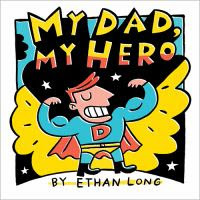 My Dad, My Hero by Ethan Long, 2011. In this sweet story a young boy tells how his father is still *his* hero, even though he cannot leap tall buildings in a single bound, does not have super strength or x-ray vision, and cannot shoot webs from his wrists, because he spends time with him. His dad may not be a superhero, but he is a super dad. This book would be great for a hero, family, or Father's Day themed program. It is short enough for younger kids and has very bright colorful illustrations in simplified comic book style, and has a slightly humorous tone. 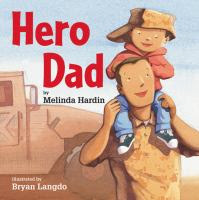 Hero Dad by Melinda Hardin and Bryan Langdo, 2010. This story compares and contrasts a boy's soldier father with a superhero. He doesn't have x-ray vision, he has night vision. He isn't invisible, but he has camouflage. He carries a rifle instead of a laser gun. He has to go away for a long time, but that's what heroes do. This story could be used in a superhero, everyday hero, or Father's Day storytime, and would be especially appreciated in communities with a higher number of military families. I like that it tells just a little about what soldiers do in a simple and age-appropriate way, to help younger children understand what their father is doing when he's away, and shows that other children are in the same situation. This would be particularly good for children who do not live on or very near a base and may not know many other children with parents in the military. 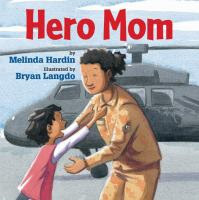 Hero Mom by Melinda Hardin and Bryan Langdo, 2013. Similar to Hero Dad, except that instead of showing just one mother and child, it portrays several different children and their mothers, doing various jobs in the military, such as construction, pilot, mechanic, transport, and medic. I like this book even better than the first, because by showing more than one family it not only portrays strong women performing several different important jobs, it also portrays various women and children of color. I would like to see a few more books in this series representing the other branches of the military, also. So there you have it. I hope someone finds this helpful, and I'd love some feedback on these, or suggestions for others, especially from those of you who *are* fans of the superhero genre!